New Colombia Resources, Inc. NEWC On Monday of last week, we offered up a special report highlighting the business of NEWC, a company with its hands in both the mining and cannabis sectors. If you missed out on that report, we’d suggest you check it out now: NEWC Special Report. Today, we’re going a step further, with an exclusive executive interview video that we’d like to present. Our interview outlet, Stock Traders Talk is back this morning after having conducted a talk with New Colombia President John Campo about the various facets of his business. It gives our readers a chance to get the skinny on NEWC straight from the horse’s mouth, so to speak, so don’t miss out! 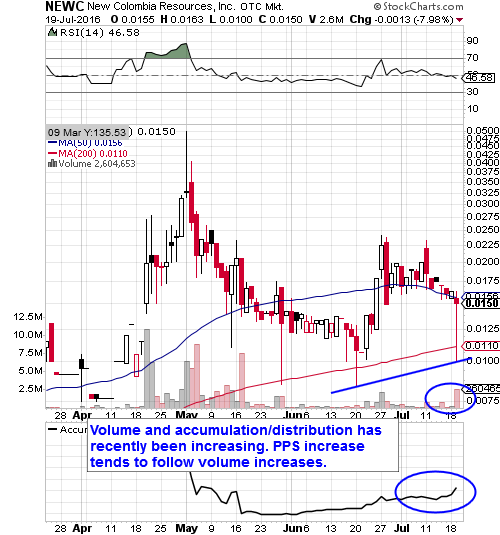 Beginning in April and up until our most recent mention of the stock last month, we tracked ONOV to exponential gains which took it from .006 to .15; a 2400% increase! This week, the stock has been ramping up to incredible new highs yet again, logging three consecutive sessions of higher highs and higher lows that have taken it up to .43. That works out to a 187% jump from our observed low last month, and a mind-melting 7067% over our all-time low from this spring. Anything from this point on would be icing on the cake, but we’ll want to see the stock maintain support off of a recent swing high at .185 to remain interested. Yesterday we signaled the NFLX Weekly $88-85.50 Puts after a poorly received earnings report from the prior day was causing the stock to backslide in the premarket. MSFT beat on earnings this morning, so we’re going to want to keep an eye on the MSFT Weekly $54.50-56.50 Calls.